Connections for chain and attachments. When using cold shuts with chain, use one size larger than chain size. With a hammer, drive the open end through the cold shut eye then peen the extended end to prevent opening. Note: Cold shuts should not be reused after closure has been made. Do not use for overhead lifting. 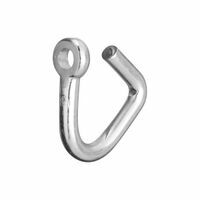 National Hardware Cold Shut, Series: 3153BC, 5/16 in, 0.32 in Rod Diameter, 0.35 in Hole Diameter, Steel, Zinc Plated, 1900 lb Load Capacity, 1.94 in Width, For Use to Couple Chain Attachments Connections for chain and attachments. 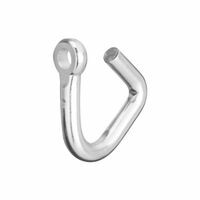 When using cold shuts with chain, use one size larger than chain size. With a hammer, drive the open end through the cold shut eye then peen the extended end to prevent opening. Note: Cold shuts should not be reused after closure has been made. Do not use for overhead lifting. Connections for chain and attachments. When using cold shuts with chain, use one size larger than chain size. With a hammer, drive the open end through the cold shut eye then peen the extended end to prevent opening. Note: Cold shuts should not be reused after closure has been made. Do not use for overhead lifting. 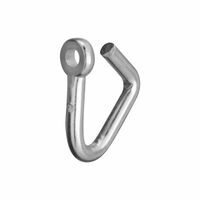 National Hardware Cold Shut, Series: 3153BC, 1/2 in, 0.47 in Rod Diameter, 0.52 in Hole Diameter, Steel, Zinc Plated, 4500 lb Load Capacity, 2.64 in Width, For Use to Couple Chain Attachments Connections for chain and attachments. 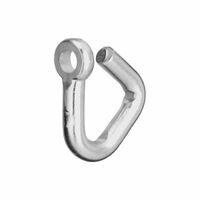 When using cold shuts with chain, use one size larger than chain size. With a hammer, drive the open end through the cold shut eye then peen the extended end to prevent opening. Note: Cold shuts should not be reused after closure has been made. Do not use for overhead lifting.